No Ifs, Ands, or Butts: Regulating Smoking Within Community Associations - Ward and Smith, P.A. The End of the Age of "Mad Men"
The past twenty years have seen a dramatic uptick in the regulation of smoking, as dozens of states and hundreds of cities and counties have enacted laws making designated public places "smoke-free." For its part, the North Carolina legislature passed an anti-smoking law in 2009 which prohibits smoking in restaurants and bars, as well as lodging establishments that serve food and drinks. While these kinds of smoking bans have become commonplace in local eateries and pubs, the issue has reached a brand new setting in the last few years: Community Associations. Community Associations ("Associations") across the country are being faced with complaints from non-smokers about their neighbors' smoking habits, particularly in condominiums and townhomes. Residents who smoke have also waged complaints, claiming that the right to smoke on their own property should not be infringed. In fact, owners have even pursued grievances against Associations and their respective Board members in court. In general, Associations, acting through their Boards of Directors, have the ability to adopt rules and regulations regarding the use of common areas by members, tenants, and guests. This includes rules that prohibit or limit smoking within clubhouses, fitness centers, pools, and open spaces. Adopting non-smoking rules, however, can be a lightning rod for division between smokers and non-smokers within a community, and issues related to smoking almost always end up in front of the Board members for a decision. When thinking about non-smoking regulations, it is common to focus on the Association's ability to impose rules, but the majority of the court cases across the nation deal with Associations' lack of enforcement of their non-smoking rules, their failure to adopt non-smoking rules, or their failure to enforce nuisance provisions of governing documents following non-smokers' complaints that a neighbor's smoking is creating a nuisance. For example, in a 2013 California case, a family sued an Association and its management company after the Association allegedly failed to address the "constant infiltration and presence of secondhand smoke" from a neighbor who smoked on a patio next to the family's condominium unit. The family claimed that the "incessant" smoke entered through their windows and sliding glass door and exacerbated their son's asthma, eventually forcing them to move out of their unit. The Association's governing documents contained no provision specifically referencing smoking, but the jury found the Association and its management company liable for negligence and breach of contract due to their failure to enforce a nuisance provision in the community's Declaration protecting the plaintiffs' right to "quiet enjoyment" of their unit. Elsewhere, courts have held that smoking in apartment buildings and communities is a breach of the covenant of quiet enjoyment (Ohio) and a breach of the warranty of habitability (Oregon). North Carolina courts, however, have not yet ruled on an Association's promulgation of rules regarding smoking. On the legislative front, in February of this year a bill was filed in the Maryland legislature that would allow a condominium’s bylaws to include “a restriction or prohibition on smoking tobacco products within the units or in the common elements.” The bill is currently pending. Until a case reaches a court in North Carolina or the General Assembly acts, it will be unclear whether an Association's lack of regulation of smoking in the community will open the Association up to liability for potential claims like those in California, Maryland, Ohio, and Oregon. In deciding whether to regulate smoking, an Association should first look to its governing documents. Many Declarations prohibit nuisances and also include provisions giving the Board the authority to adopt policies regulating conduct within the community. 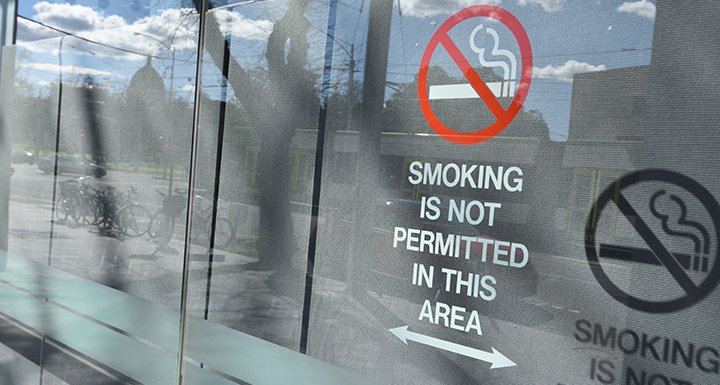 In such instances, a Board can likely adopt policies such as prohibiting smoking in common areas, or designate smoking areas within sections of the common areas. If the Board refuses to adopt a smoke-free policy and prefers authorizing smoking in certain areas, designated smoking areas should be as far from doors, windows, and entrances as possible to avoid nuisance or quiet enjoyment claims from non-smoking neighbors. The smoking issue becomes less clear with respect to prohibiting smoking inside a person's own home or unit. Generally, unless the Declaration specifically provides the Association with rule-making authority for conduct within a home or unit, Associations cannot regulate conduct within one that is privately owned. If the Association does adopt rules or regulations prohibiting or limiting smoking in any home or unit within the community, the Association should, in all cases, consistently enforce such rules and regulations or risk opening itself up to additional liability for failure to enforce. Ultimately, it will likely be up to the North Carolina courts to strike a balance between the competing interests of smokers and non-smokers in communities governed by Associations. In the meantime, Associations should carefully document all complaints made by neighbors involving smoking within a home or unit and should seek legal advice at the first sign of smoke. © 2019 Ward and Smith, P.A. For further information regarding the issues described above, please contact Adam M. Beaudoin or Caroline O. Outten, CIPP-US.